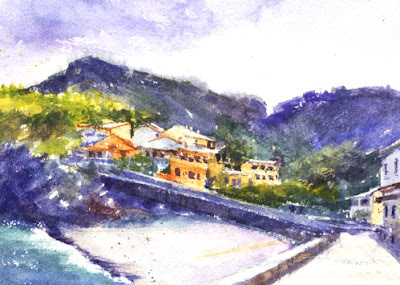 I'm always excited to participate in the Virtual Paintout each month. Bill Guffey chooses the month's location for artists to virtually look around for their paint-out location using Google Street View. I really enjoy seeing so many parts of the world that I'll never be able to personally visit. It's amazing to see where the Google Street View vehicles have travelled. 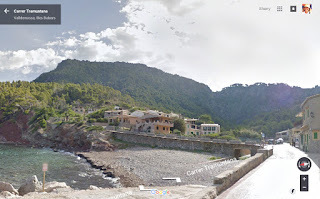 I was surprised to see the location for January 2016 was the island of Majorca. 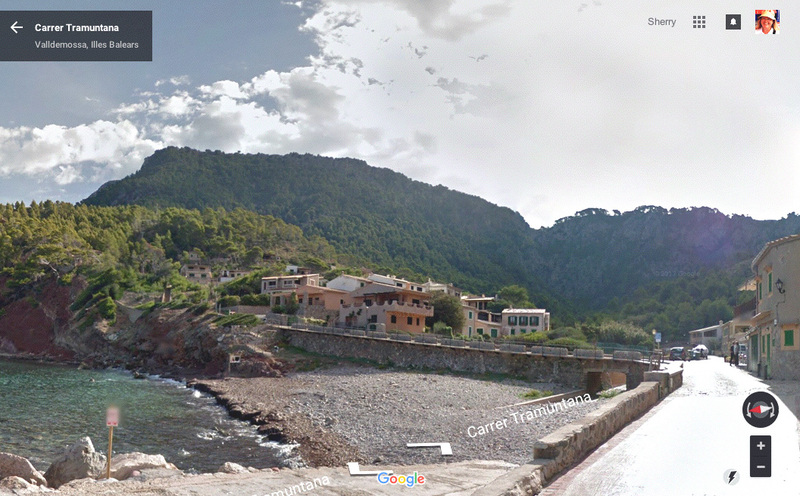 Or, Mallorca, which is a part of Spain. Many years ago I saw a PBS program about gardens in Majorca. The mountainous island looked gorgeous on TV. All these years later, it still looks like a beautiful place. As always, I found a lot of interesting views that might make a good watercolor. It's good painting practice for me. 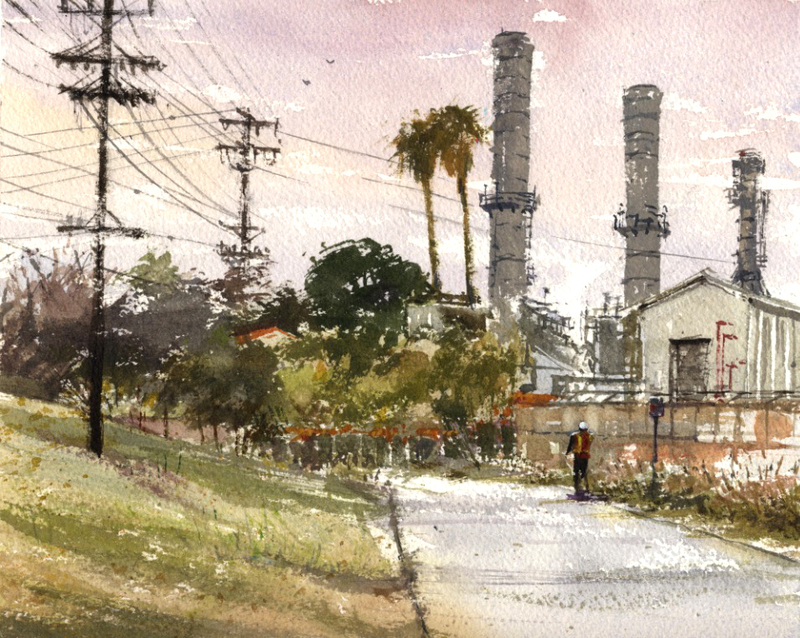 I'm always excited to see what I can find to paint when we meet at the Pasadena Water & Power plant. The entrance is on State Street behind the main structures. 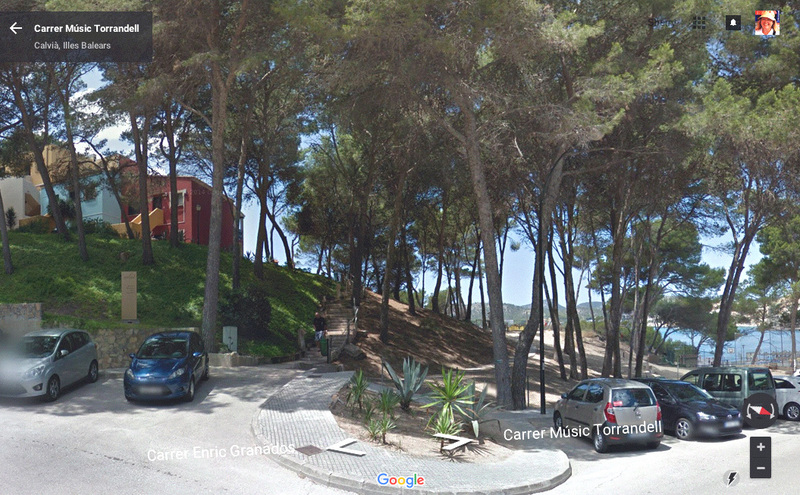 State is sort of a dead end street so there isn't much traffic, and there's a wild hillside for artists to paint from. On our last visit I painted a gouache piece while I sat at the base of the hill, West On State. I wanted to try the same view in watercolor. 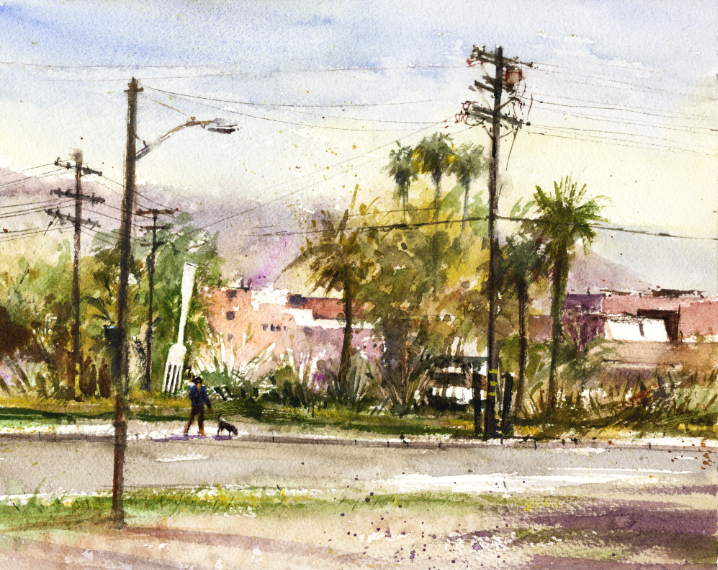 This time I added the utility poles I left out on the gouache painting. The plant is still undergoing construction to update. I hope some of the characteristic buildings will remain. It's been a prominent feature in Pasadena for so long. I'm looking forward to painting more views. The view from farther up on the hillside. The Los Angeles area seems to be having summer weather in February. But last month, it was cold and winter-y...for Southern California. Our paint-out at the 1908 Arts and Crafts masterpiece Gamble House in Pasadena was on a very dreary day. Overcast day or not, it's always a treat to be at the Greene and Greene designed Gamble House. It has a special mood and character. On my previous paint-out there I tried a gouache piece of the distinctive lantern on the rear patio, The Gamble House Lantern. With its many spectacular porches and dark stain, I find the house difficult to paint in watercolor. I had in mind to keep it simple, more of a silhouette, and try another watercolor. I'll be painting there again soon and looking forward to seeing what view I can find! My fellow painters...view from the patio. What a nice painting day I had in January at the local Arboretum! The Aloe Collection was in bloom and my fellow painters were setting up in that area so I did as well. The last time I painted there, I tried a gouache piece of the old greenhouse, The Greenhouse. I really like greenhouses and lath houses. 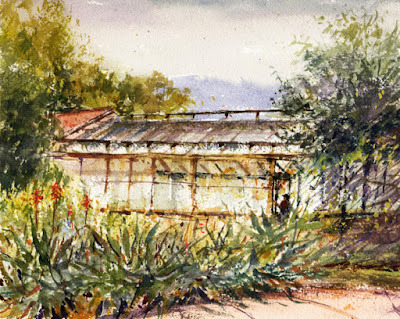 With a wonderful opportunity to paint the aloe area greenhouse again, I decided to try a watercolor this time. Looking forward to my next visit as always! We usually have an audience during our lunch and discussion. 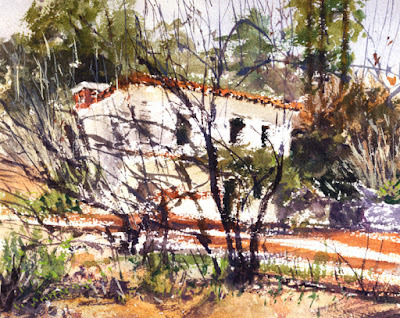 I've painted at Pasadena's Central Park quite a few times with the various plein air groups. 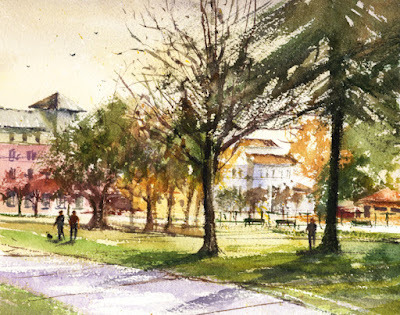 But I haven't painted the park before. The impressive and memorable view to paint is actually north across the street...the landmark Castle Green Hotel. I've tried painting the hotel on four previous paint-outs, my most recent almost two years ago, The Green Hotel. On my previous paint-out at the park I did a gouache piece of an 1880s building across the street, Central Park. This time I decided to try a watercolor of the large park through the dark trees. The light on the ground contrasted so beautifully with the dark evergreens. There is a lawn bowling court at the other end of the park that I'd like to try sometime. Since I go out with several paint-out groups I'm behind on posting my paintings. And I should catch up on some that are a few months old. But I had so much fun yesterday with our Saturday group that I'm adding that piece today. Just a few of us returned to Fork Plaza in Pasadena, to paint the fork in the road as well as the 18 foot tall fork. We painted there over three years ago, an early plein air piece for me, The Fork. The fork was put there in 2009 and went through some city politics before it was allowed to stay. The day felt like spring even though it's February, and the view was bright and clear. We painters had several choices of interesting views from the state owned vacant lot where we found our shady spots. There was even a lovely, picturesque alley I hadn't noticed before. But, it was about the fork and I loved all the verticals in my view - the fork, palms, and utility poles. The 18 foot tall fork from behind. Last month I returned to the Old Mill in San Marino for a paint-out. I didn't realize it's been over two years since I last painted there and posted, Fall at the Old Mill. Also, I haven't visited the property in January before. 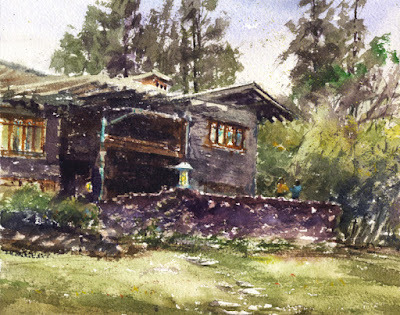 The old adobe building from 1816 is surrounded with lovely gardens and fruit trees. I was surprised to see the the pomegranate trees bare of leaves as well as fruit. The trees usually shade the patio area so it was striking to see just dark trunks and branches. 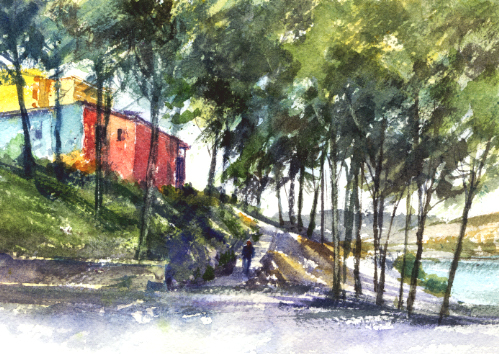 I just loved that dramatic view and painted a watercolor from the path outside the line of trees, looking through them. Fun piece to try!